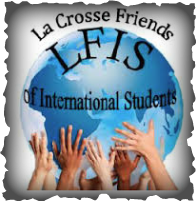 La Crosse Friends of International Students (LFIS) is a local voluntary organization which pairs college students from other nations with families so that personal connections can be made and friendships engendered. Students do not live with their host families. The University of Wisconsin La-Crosse offers an LFIS host to their incoming international students. The program is an option which is accepted by a majority of the students. Become a friend to the student. 1. First make contact. Please make contact as soon as possible after you have students assigned. You will be given basic contact information (telephone number, address and email address). It is the host family’s responsibility to make the initial contact. This is not always easy since students no longer have telephones in their rooms and sometimes do not yet have a cell phone at the time they complete their registration form. Persistence is necessary. When contact is made ask for their class and work schedule. It will be helpful to know when they are potentially available. Ask for their cell number (if you don’t have it), and make sure you have both their student email address and their private email address. The schools use these simple formulae to establish student email addresses. No doubt the best way is to invite them into your home for a meal although you may have briefly met them if you attended one of the planned group activities that LFIS gives for incoming students and host families. These include a boat trip on the La Crosse Queen, an annual picnic at Myrick Park in September, and a soup supper in January. Students may need advice, information, a ride to the airport, or to Walmart. However, it is a shared experience among host families that students rarely ask for help. • When possible include student(s) on a trip to another city or place of interest (almost any place is of interest to many of them). • Try to include them when something interesting and/or typical Americana occurs. State and county fairs come to mind. • Include them in your everyday ordinary activities occasionally. This is up to you and is of course quite variable. Some families see their students once or twice a month. Others might see their students once every other month. It is hoped that the frequency of meetings is enough to ensure an excellent experience that the individual can draw on when they return home. Students are here for 3 months up to 5 years and beyond for their schooling. Ordinarily their needs for you will diminish over time and contacts may become less frequent. It will be up to you to decide to reduce or even stop your involvement with a student if you feel the need or interest waning. It is possible that long term international friendships can develop that last long after a student returns to their native country.